This collection provided presenters from the May 2017 Pedagogicon, held at the Crabbe Library on Eastern Kentucky University’s campus, with an opportunity to turn their effort into that next level of scholarship, a published article focused on valuable pedagogical approaches using the Scholarship of Teaching and Learning (SoTL), defined as “the study of teaching and learning and the communication of findings so that a body of knowledge can be established” (Bishop-Clark & Dietz-Uhler, 2012, p. 1). Some of the manuscripts selected for inclusion began as 40-minute presentations, while others started out as research posters. The authors in this collection build on their presentations in important and scholarly ways to share these current strategies. Every manuscript passed through many mentored drafts. The manuscripts accepted for inclusion represent teaching and learning approaches—in varying stages of development or implementation—of value to scholars on many different campuses, many ready for you to implement or adapt on your own campus. Ways to incorporate diversity into teaching and learning. Connecting Student Learning and Effective Teaching. 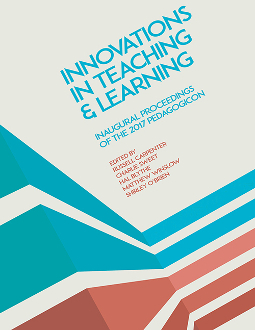 We see these threads as working independently and collectively to represent the important—and innovative—concepts and strategies shared at the 2017 Pedagogicon. We encourage our scholars herein to keep ascending the Scholarship Mountain. When they reach the top, they can look back and see this publication as one of their trail markers. We encourage you to read these articles closely. Hopefully, you will learn as much as our own scholars.